That was the original idea, wasn't it? Assemble a Big-3 of Al Horford, Kyrie Irving and Gordon Hayward and go for it. Season-ending injuries to both Gordon and Kyrie derailed that notion last season, but it is coming to fruition now. Hayward may be coming off the bench, but he isn't playing like it. 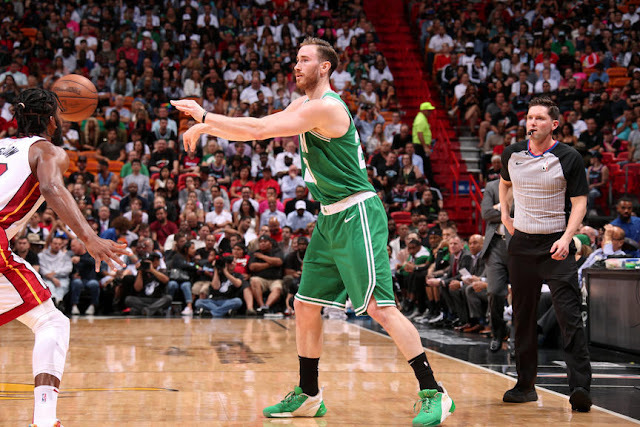 In Boston's 112-102 win over the Miami Heat last night, Hayward was aggressive. He scored 25 points on 5-of-10 from the field, 3-of-5 on threes and 12-of-13 from the foul line. He grabbed eight rebounds and handed out five assists, but it was the 13 free throw attempts that really got our attention. Hayward is trusting his ankle not to let him down, while shooting and driving into the paint with authority. He is now clicking nicely with the other two members of the Celtics Terrific Trio. Al had a stat line of 21/8/4 (points, rebounds,assists), and Kyrie had 23/1/4. The question remains as to whether Gordon will remain on the second unit. Now that his health and athleticism are back, it can be argued that he should be in the starting unit. But it seems that his experience, savvy and clever decision making are needed off the bench. He will get ample time with his Big-3 teammates and should close most game for the guys in green. The Big-3 are finally clicking - just as we envisioned. This is the first time Kyrie, Horford and Hayward all reached the 20-point mark in the same game.